Tagged under Take, White Fox, Light Novel, Series. 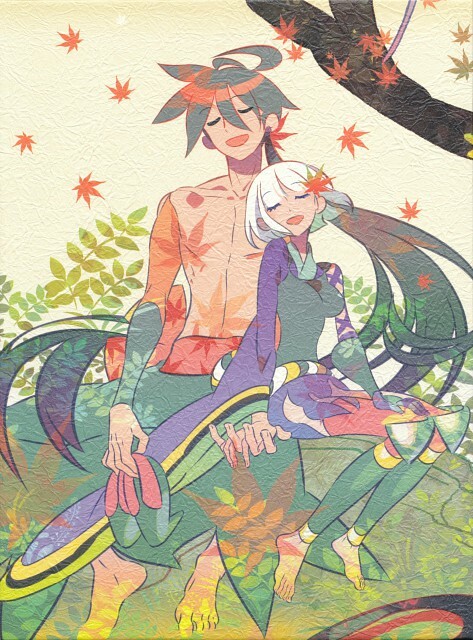 Some have complained about the pacing of Katanagatari being a bit on the slow and deliberate side, but that does not show as much in this span of episodes as it does in some later ones. Besides, those looking for a more dedicated action fantasy probably gave up many episodes earlier anyway. This is not a fantasy action series, but a true and full-blooded fantasy series at its finest. It even does a superb job of taking the original novel and expanding it by enriching the characterizations and more thoroughly exploring the setting. It looks great, sounds good, and does its job well in world-building and character development departments. The end result makes this one of the decade's highlight anime series. Decided to pick this up because the artwork got my attention; it's a style you don't see often. The episode lengths surprised me, but in a good way (it's not very often you see that in a regular series; it's more towards OVA's). Togame and Shichika are funny to watch. I liked the many unsaid and not shown things, the fake truth, the unspoken feelings and the objectives only revealed at the end. I liked the narration of the facts carried out by an external voice, which made the story looks like a fairy tale told by a dear granny before going to bed. I liked the animation and the art. Some fights were spectacular, to compensate for loooong speeches. I didn’t feel particular sympathy for the characters, but my opinion was redeemed at the end. Both have shown various parts of themselves and have changed a lot, throughout the story. I was surprised by the length of the episodes (almost 50 min. ), each one with a different ending theme. Anyway, more than a sword technique, the Kyotōryū looks like a martial art. Also, it left me a bit puzzled that guns and dolls can be defined swords: they are simply weapons. SHOGUN: "I’ll give you the country, don’t you want power over the country?" SHICHIKA YASURI: "Like I’d give a damn about that, cheerio!!" I think I stopped watching it at the 3rd episode. The whole swordsmanship without using sword is an awesome idea, and they definitely make it looks so cool. But I can't continue watching it. Mostly because of the main characters. I'd probably watch it when I'm extremely bored. But for the time being, let's leave it unfinished. I must say the anime really amazed me, the characters grew enormously throughout just 12 episodes, everything was simply awesome, the story, the music, the art, and more importantly the ending was really really good. This is easily one of the best anime ever, if for nothing else, its art direction. It's hard to make a brief praising about the anime, because there is so much it does right. So, I'll just leave it as this simple phrase, and call it perfect; Katanagatari is the Okami of anime. Wasted 11 episodes collecting something they'd end up breaking in the end anyways D: It was such a let down! I man, I stil love tanime and I thought the art was so unique, but really now, what was the point of the whole journey if everything they do is undone in the end??? GAH so frustrating. But whatever, it was a good series and had some inner messages I think about just following what's best for you and not what's best for others. The romance was cute because it wasn't the focus of the series. I really loved that. that, in my opinion, did not have the deserved recognition. The plot is, indeed, excellent. Characters are all very innovative. represents with pinpoint perfection the relationship between the two main characters. I really love this anime, an anime i found by chance. The animation is really unique! The action scenes are awesome! The music is cool! of course composed of Iwasaki Taku!